If there’s one thing Japan is praised for the world over, it’s the punctuality, wide coverage, and convenience of its railway system. 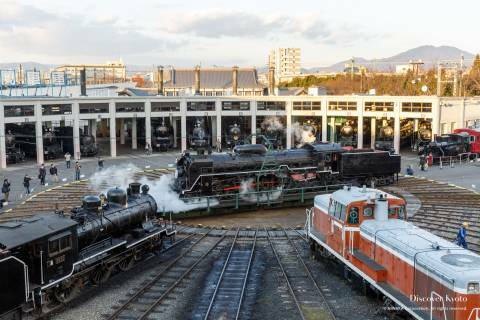 Here in Kyoto you’ll surely make use of the shinkansen bullet train when you arrive or leave, and the local lines that crisscross the city for sightseeing… But if you want to do more than just ride, you can always visit the Kyoto Railway Museum! Opened in 2016, this shiny new museum is a sprawling space that covers everything about trains, from their construction and operation to their history and services. Interactive in many ways, this museum has lots of areas where guests can touch and operate exhibits in a way that makes things both educational and fun, making it great for visitors traveling with families. The real trains are hard to overlook, but be sure not to miss the train conductor simulators and the country’s largest train diorama! No matter how many trains you ride during your visit to Japan, there’s very few chances to actually examine the trains themselves, seeing as most of them pull up to the station and then leave as soon as passengers board. Here at the Kyoto Railway Museum there are 53 real train cars on display, spanning over 130 years of train history in Japan all the way back to “Yoshitsune”, the very first steam locomotive imported from the USA. In addition to the classic steam engines, you can also explore diesel, diesel-hydraulic, and electric models. With examples of commuter cars, sleepers, and dining cars from over the years, as well as early model shinkansen bullet trains, the Kyoto Railway Museum provides quite the comprehensive exhibition! For a detailed list of all 53 trains on display, check the museum’s official website. The real appeal of the Kyoto Railway Museum is how amazingly interactive its exhibits are. In the Railway Facilities section you can operate models of railway traffic signals and changing tracks, and for even more entertainment and hands-on experience you can explore the driver’s seat controls of several trains in the Vehicle Structures section. There are quite a few fun stations in the same section that allow you to understand how train cars are coupled together, how their wheels move so smoothly over the tracks, and other key concepts. There is even a mock railway on hand in the operational systems area with cameras mounted on the front that makes visitors feel as if they’re driving along through the miniature city! The most popular interactive exhibit, however, has got to be the driving simulators. 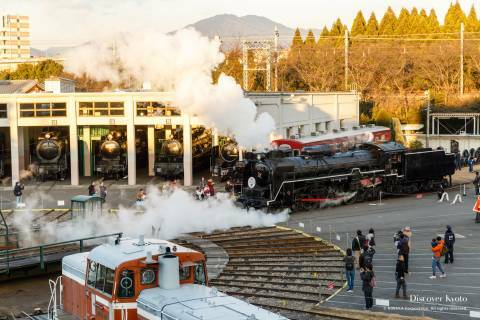 You will need to enter into a lottery for a set time to access the simulator, but there’s no question that this is one of the top attractions at the Kyoto Railway Museum. Both adults and children can enjoy these hi-tech simulators, which are based on the same models used for training actual drivers! For those in a more playful spirit, official looking caps and coats are available to dress the part. Take a moment to peruse the English guide before you take the controls, and have a blast driving along either local or shinkansen bullet train routes. Watch your speed and make sure to brake on time, or you might overshoot the station and leave your virtual passengers stranded! Beside the operating railways that lead to Kyoto Station is a short little track designed especially for the SL Steam model train that belongs to the Kyoto Railway Museum. It requires a separate ticket that you can purchase at the boarding platform (300 yen for adults or high school students, 100 yen for children aged 3 and older), and trains depart at 15-45 minute intervals depending on the day’s visitor traffic. 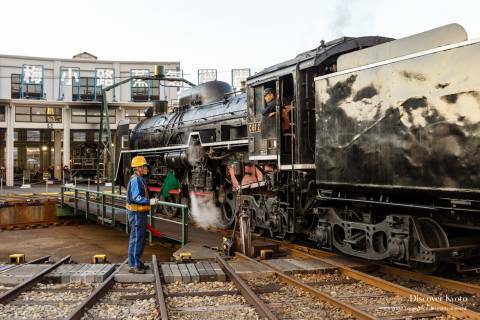 This real steam-powered train operates from 11:00 to 16:00, and after the last ride of the day you can watch the museum’s roundhouse platform, an Important Cultural Property, go to work! Don’t miss the many classic examples of steam locomotives housed around the turntable, either! From the museum’s third floor you can access the Sky Terrace, an open area that provides a beautiful view of Kyoto City and the many train tracks heading towards the nearby Kyoto Station. With both the Kyoto Tower and the Tō-ji temple’s five-storied pagoda in the skyline you can get some amazing photos of passing trains and city scenery. If you consult the helpful screen tracking inbound and outbound trains, you can make sure to catch shinkansen, locals, rapids… whichever train you wish! An impressive diorama on the second floor of the Kyoto Railway Museum that is approximately 10 meters by 30 meters in size is said to be the largest in Japan. In a complex and realistic set-up of tracks, tunnels, stations, railroad yards, and bridges, little 1/80 scale trains from all over the country go about their daily business to merry tunes and whistles as the lights and video change to reflect the sun rising and setting. Though it is only in Japanese, a staff member provides a charming narration of the “day” in the life of the diorama, tipping guests off to which trains are moving and where to look. Show times are subject to change based on visitor numbers, but you can generally expect them at 11:00, 12:30, 13:30, 14:30, and 16:00. 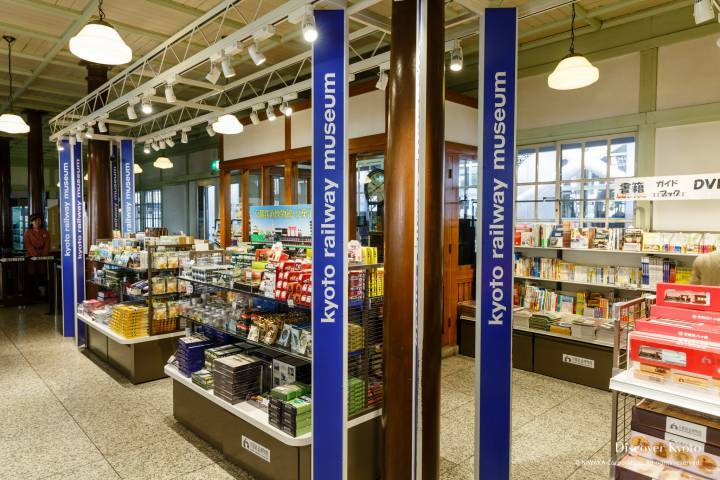 The Kyoto Railway Museum is a fun trip for anyone particularly interested in trains or how things work, but it’s an even bigger attraction for those travelling with young children. Containing a Kids Park play area, interactive and educational exhibits, models, simulators, and a train ride, it’s a paradise where you can let your kids loose for as long as they want to enjoy themselves. Designed with children in mind, the museum has coin lockers, nursing rooms, stroller parking, and more services to make the trip easier on parents, too. 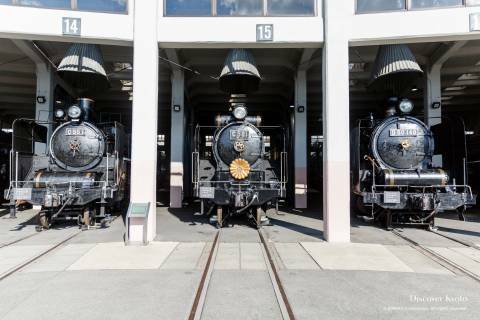 If you’re visiting Kyoto with children, make sure to put the Kyoto Railway Museum on your list!